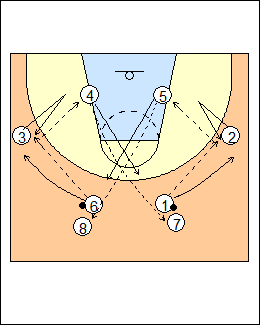 Feed the post from the wing (you have to be able to make the pass to the wing). Two balls, the wings v-cut, pop out for an outside-hand flick pass, catch and feed the post above the shoulder or below the waist, the posts pass opposite, all players follow their pass. 2 and 3 are the next players in the post. Make 25 clean catches in a row in the post (a bobble take you back to 0). - all-time defenders on the posts and the wings. Make 25-25-25 clean catches in a row in 6 minutes. See Passing - Team post, Post play - UCLA shooting. Her favourite way to feed the post is from the middle of the floor, defensively it's a problem when an attacker is in the middle of the lane (which side to defend on), and it's very difficult to double-team a muscle post [duck in] when the ball swings back to the middle of the floor (the channel). Hubie Brown - the easiest place to post is on the dotted line in front of the rim, because everyone plays behind you, nobody fronts. 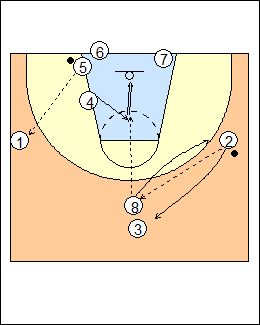 Posts are on the baseline, 2 and 3 have a ball. As 3 passes to 1, 5 muscles into the middle of the lane (square to the ball), 1 feeds him for a clean finish (a backboard swish), 1 replaces 3. Make sure the post feed is realistic (e.g. fake low and pass high, fake high and pass low). 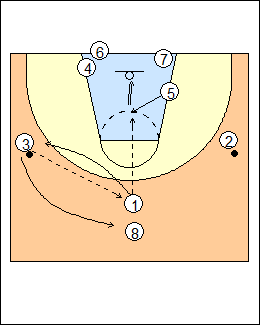 Get the first ball to 1, 4 is the next shooter, on a pass from 2 to 8. Make 10 clean finishes in a row. - add a defender on the passer. - seal in on a skip pass (by 4, on a skip pass from 2 to 1). 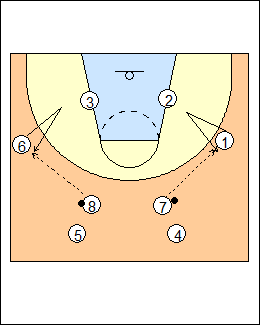 See Post play - High-low passing, Duck in, Weakside 1 on 1.